It is a very common requirement to update field values based on some conditions. If you want to update a column / field value then either you will write some event receivers or code or you can write a workflow using SharePoint designer. 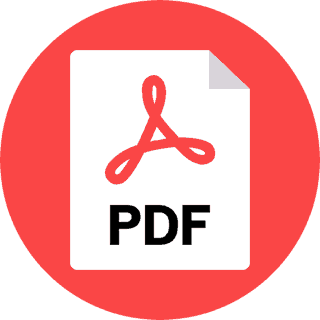 But if you want to achieve this requirement without using code or workflow, then you can use Infowise Ultimate Forms Update action. You can update column value based on conditions by using Update action. If you are new to Infowise Ultimate Form, then go through my previous articles. As per the business requirement, I have a Training Request List which as a Course and Comments column among others. Whenever users choose SharePoint Online option from Courses, then it should add some additional comments into the comment field. We will see how we can achieve this by using Infowise Ultimate Forms Update Action. Now in the General Settings, choose the Action type as “Update list item”, give a name and desctiption for the action. Then select Run on events as New and Edit (You can choose as per your business requirement). 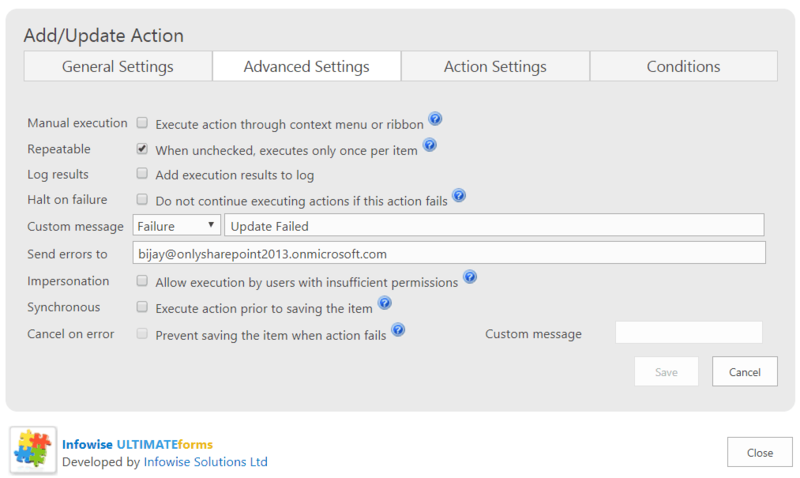 In the advanced settings I have choose a custom message on action failed and also send the error to a particular user. 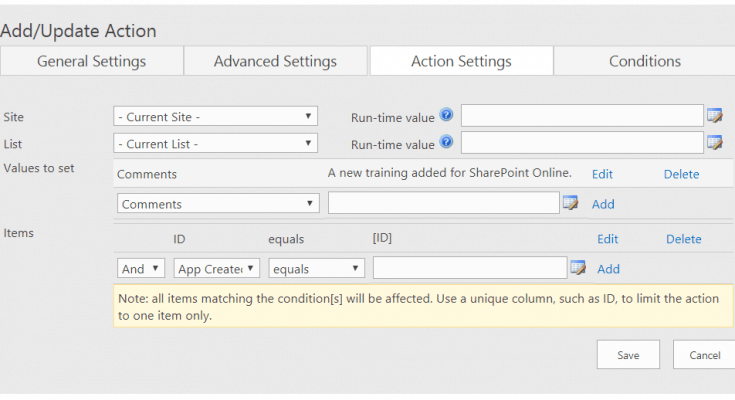 Then in the action settings, I choose the Site as Current Site, List as Current List and in the Values to set I have add a string message as “A new training added for SharePoint Online” in the comments column. And put the Condition as ID equals [ID] so that only that item will be reflected. Now once the action is ready, we can test if the action is working fine or not. Now we can test whether the action is working fine or not. Here I had added two items in the list, In the 1st item I had choosen Course as “SharePoint 2016” and Infowise Ultimate forms update action did not do anything because the condition did not match. In the 2nd item I have choosen the Course as “SharePoint Online” and you can see it added the content in the Comments box. Here we have seen how easily we can update column value without using code or workflow, simply by using Infowise Ultimate Forms Update action.